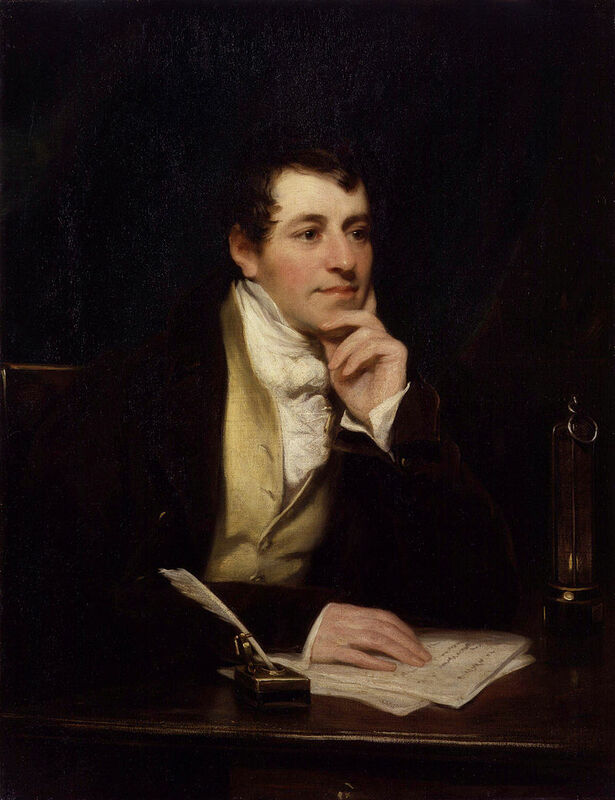 Today is the birthday (1778) of Sir Humphry Davy, 1st Baronet PRS MRIA FGS, a Cornish chemist and inventor whom I remember chiefly as the inventor of the Davy safety lamp for miners, but who had an illustrious career as a chemist. He isolated a series of elements for the first time – potassium, sodium, calcium, strontium, barium, magnesium and boron, as well as discovering the elemental nature of chlorine and iodine. He also studied the forces involved in these separations, inventing the new field of electrochemistry. Besides the Davy Lamp he invented a very early form of the incandescent light bulb. Davy was born in Penzance in Cornwall but his family moved to Varfell, near Ludgvan, when he was 9, and in term-time Davy boarded with John Tonkin, his mother’s godfather. After Davy’s father died in 1794, Tonkin apprenticed him to John Bingham Borlase, a surgeon with a practice in Penzance. In the apothecary’s dispensary, Davy became a chemist, and he conducted his earliest chemical experiments in a garret in Tonkin’s house. Davy’s friends said: “This boy Humphry is incorrigible. He will blow us all into the air.” His elder sister complained of the ravages made on her dresses by corrosive substances. His Quaker friend and mentor Robert Dunkin remarked: ‘I tell thee what, Humphry, thou art the most quibbling hand at a dispute I ever met with in my life.’ One winter day he took Davy to a river to show him that rubbing two plates of ice together developed sufficient energy by motion, to melt them, and that after the motion was suspended, the pieces were united by regelation. Later, as professor at the Royal Institution, Davy repeated many of the ingenious experiments he learned from Dunkin. Through a mutual friend he met Dr Edwards who was a lecturer in chemistry at St. Bartholomew’s Hospital (Barts). He permitted Davy to use his laboratory and possibly directed his attention to the floodgates of the port of Hayle, which were rapidly decaying as a result of the contact between copper and iron under the influence of seawater. Galvanic corrosion was not understood at that time, but the phenomenon prepared Davy for subsequent experiments on ship’s copper sheathing. Thomas Beddoes and John Hailstone were engaged in a geological controversy on the rival merits of the Plutonian and Neptunist hypotheses. They traveled together to examine the Cornish coast for evidence of their competing theories and made Davy’s acquaintance. Beddoes, who had established at Bristol a ‘Pneumatic Institution,’ needed an assistant to superintend the laboratory. After prolonged negotiations, mainly by Gilbert, Mrs Davy and Borlase consented to Davy’s departure, but Tonkin wished him to remain in his native town as a surgeon, and altered his will when he found that Davy insisted on going to Dr Beddoes.On 2 October 1798, Davy joined the Pneumatic Institution at Bristol. It had been established to investigate the medical powers of factitious airs and gases, and Davy was to superintend the various experiments. The arrangement agreed between Dr Beddoes and Davy was liberal and enabled Davy to give up all claims on his paternal property in favor of his mother. He did not intend to abandon the medical profession and was determined to study and graduate at Edinburgh but he soon began to fill parts of the institution with voltaic batteries. While living in Bristol, Davy met the Earl of Durham, who was a resident in the institution for his health and became close friends with Gregory Watt, James Watt, Samuel Taylor Coleridge and Robert Southey, all of whom became regular users of nitrous oxide, to which Davy became addicted. 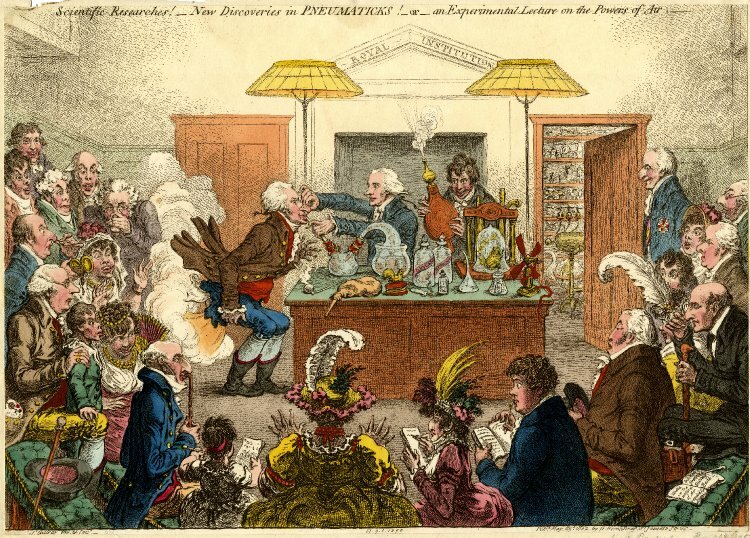 James Watt built a portable gas chamber to facilitate Davy’s experiments with the inhalation of nitrous oxide. At one point the gas was combined with wine to judge its efficacy as a cure for hangover (his laboratory notebook indicated success). The gas was popular among Davy’s friends and acquaintances, and he noted that it might be useful for performing surgical operations. However, anesthetics were not regularly used in medicine or dentistry until decades after Davy’s death. Davy conducted numerous experiments on himself with nitrous oxide, carbon monoxide, and with respiration at considerable risk. Davy’s lectures also included spectacular and sometimes dangerous chemical demonstrations for his audience, a generous helping of references to divine creation, and genuine scientific information. Not only a popular lecturer, the young and handsome Davy acquired a huge female following around London, and nearly half of the attendees pictured in Gillray’s cartoon of the Royal Institution are female. When Davy’s lecture series on Galvanism ended, he progressed to a new series on Agricultural Chemistry, and his popularity continued to skyrocket. By June 1802, after just over a year at the Institution and at the age of 23, Davy was nominated to full lecturer. In 1802 Davy had what was then the most powerful electrical battery in the world at the Royal Institution. With it, Davy created the first incandescent light by passing electric current through a thin strip of platinum, chosen because the metal had an extremely high melting point. It was neither sufficiently bright nor long lasting enough to be of practical use, but demonstrated the principle. By 1806 he was able to demonstrate a much more powerful form of electric lighting to the Royal Society in London. It was an early form of arc light which produced its illumination from an electric arc created between two charcoal rods. 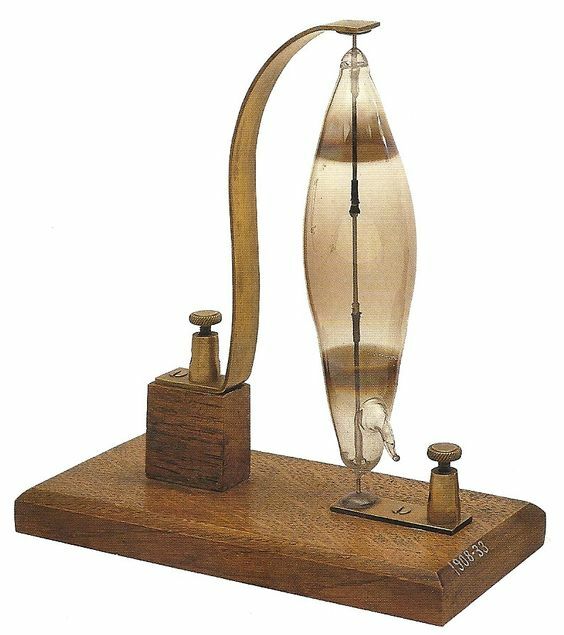 Davy was a pioneer in the field of electrolysis using the voltaic pile to split common compounds and thus prepare many new elements. He went on to electrolyze molten salts and discovered several new metals, including sodium and potassium. Davy discovered potassium in 1807, deriving it from caustic potash (KOH). Before the 19th century, no distinction had been made between potassium and sodium. Potassium was the first metal that was isolated by electrolysis. Davy isolated sodium in the same year by passing an electric current through molten sodium hydroxide. Davy discovered calcium in 1808 by electrolyzing a mixture of lime and mercuric oxide. He worked with electrolysis throughout his life and was first to isolate magnesium, boron, and barium. Chlorine was discovered in 1774 by Swedish chemist Carl Wilhelm Scheele, who called it “dephlogisticated marine acid” and mistakenly thought it contained oxygen. Davy showed that the acid of Scheele’s substance, called at the time oxymuriatic acid, contained no oxygen. This discovery overturned Lavoisier’s definition of acids as compounds of oxygen. In 1810, chlorine was given its current name by Humphry Davy, who insisted that chlorine was in fact an element. Davy later damaged his eyesight in a laboratory accident with nitrogen trichloride. Pierre Louis Dulong first prepared this compound in 1812, and lost two fingers and an eye in two separate explosions with it. Davy’s own accident induced him to hire Michael Faraday as a co-worker. In 1812, Davy was knighted, gave a farewell lecture to the Royal Institution, and married a wealthy widow, Jane Apreece. (While Davy was generally acknowledged as being faithful to his wife, their relationship was stormy, and in later years he travelled to continental Europe alone.) In October 1813, he and his wife, accompanied by Michael Faraday as his scientific assistant (and valet), travelled to France to collect a medal that Napoleon Bonaparte had awarded Davy for his electro-chemical work. While in Paris, Davy was asked by Gay-Lussac to investigate a mysterious substance isolated by Bernard Courtois. Davy showed it to be an element, which is now called iodine. The party left Paris in December 1813, traveling south to Italy. They stayed a while in Florence, where, in a series of experiments conducted with Faraday’s assistance, Davy succeeded in using the sun’s rays to ignite diamond, proving it is composed of pure carbon. Davy’s party continued to Rome, and also visited Naples and Mount Vesuvius. By June 1814, they were in Milan, where they met Alessandro Volta, and then continued north to Geneva. They returned to Italy via Munich and Innsbruck, and when their plans to travel to Greece and Istanbul were abandoned after Napoleon’s escape from Elba, they returned to England. After his return to England in 1815, Davy experimented with lamps for use in coal mines. There had been many mining explosions caused by firedamp or methane often ignited by open flames of the lamps then used by miners. In particular the Felling mine disaster in 1812 near Newcastle caused great loss of life, and action was needed to improve underground lighting and especially the lamps used by miners. Davy conceived of using an iron gauze to enclose a lamp’s flame, and so prevent the methane burning inside the lamp from passing out to the general atmosphere. Although the idea of the safety lamp had already been demonstrated by William Reid Clanny and by the then unknown (but later very famous) engineer George Stephenson, Davy’s use of wire gauze to prevent the spread of flame was used by many other inventors in their later designs. 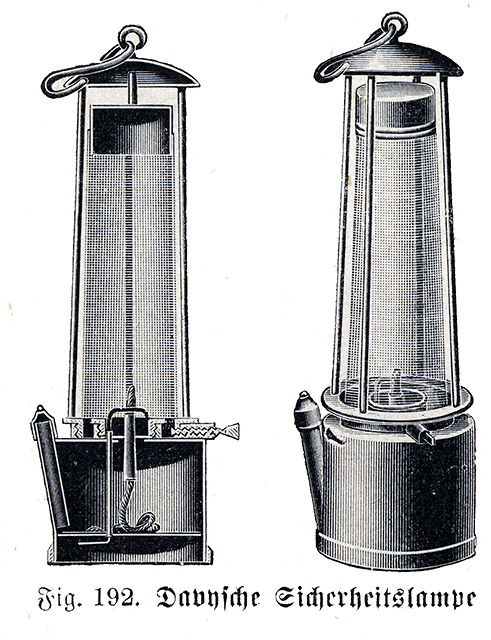 George Stephenson’s lamp was very popular in the north-east coalfields, and used the same principle of preventing the flame reaching the general atmosphere, but by different means. Unfortunately, although the new design of gauze lamp initially did seem to offer protection, it gave much less light, and quickly deteriorated in the wet conditions of most pits. Rusting of the gauze quickly made the lamp unsafe, and the number of deaths from firedamp explosions rose yet further. There was some discussion as to whether Davy had discovered the principles behind his lamp without the help of the work of Smithson Tennant, but it was generally agreed that the work of both men had been independent. Davy refused to patent the lamp, and its invention led to his being awarded the Rumford medal in 1816. In January 1819, Davy was awarded a baronetcy. Although Sir Francis Bacon and Sir Isaac Newton had already been knighted, this was, at the time, the first such honor ever conferred on a man of science in Britain. A year later he became President of the Royal Society. 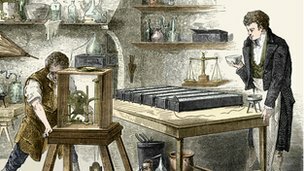 Davy’s laboratory assistant, Michael Faraday, went on to enhance Davy’s work and would become the more famous and influential scientist. Davy is supposed to have even claimed Faraday as his greatest discovery. 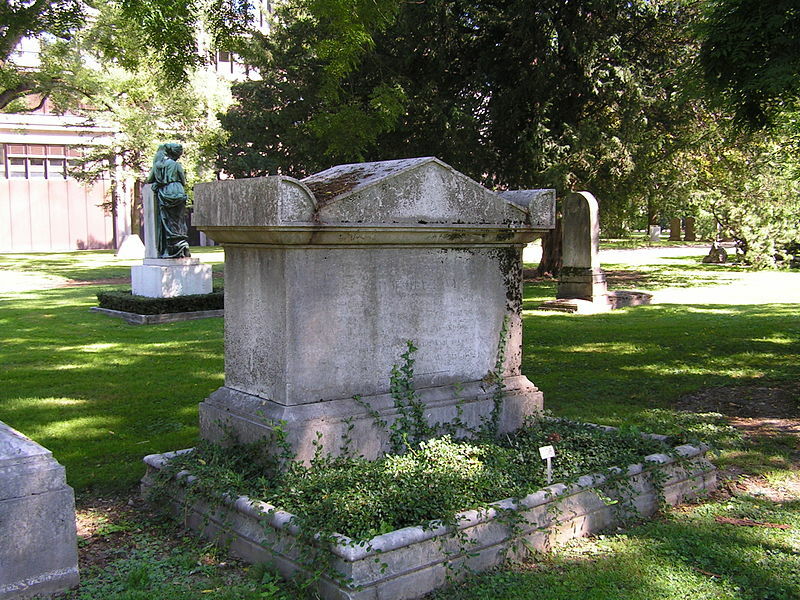 Davy later accused Faraday of plagiarism, however, causing Faraday (the first Fullerian Professor of Chemistry) to cease all research in electromagnetism until his mentor’s death. Davy spent the last months of his life writing Consolations in Travel, an immensely popular, somewhat freeform compendium of poetry, thoughts on science and philosophy. Published posthumously, the work became a staple of both scientific and family libraries for several decades afterward. Davy spent the winter in Rome, hunting in the Campagna on his 50th birthday. But on 20 February 1829 he had a stroke. After spending many months attempting to recuperate, Davy died in a hotel room in Geneva on 29 May 1829. He had wished to be buried where he died, but had also wanted the burial delayed in case he was only comatose. He refused to allow a post-mortem for similar reasons. But the laws of Geneva did not allow any delay and he was given a public funeral on the following Monday, in the Plainpalais Cemetery, outside the city walls. Jane organized a memorial tablet for him, in Westminster Abbey shortly afterwards. What do you think will happen if we don’t include the egg? What do you think will happen if we don’t include the oil? Little by little I could begin to enjoy the unprecedented colors and plays of shapes that persisted behind my closed eyes. Kaleidoscopic, fantastic images surged in on me, alternating, variegated, opening and then closing themselves in circles and spirals, exploding in colored fountains, rearranging and hybridizing themselves in constant flux. 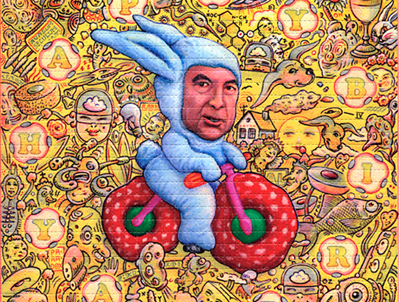 The events of this first LSD trip, now known as “Bicycle Day”, after the bicycle ride home, proved to Hofmann that he had indeed made a significant discovery: a psychoactive substance with extraordinary potency, capable of causing significant shifts of consciousness in incredibly low doses. 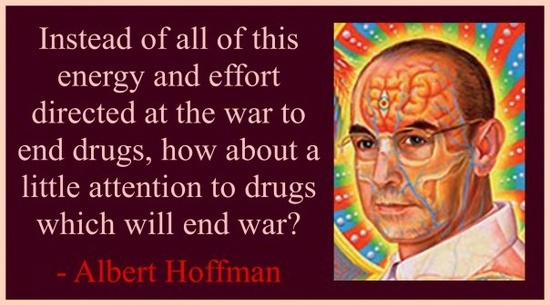 Hofmann foresaw the drug as a powerful psychiatric tool; because of its intense and introspective nature, he couldn’t imagine anyone using it recreationally. 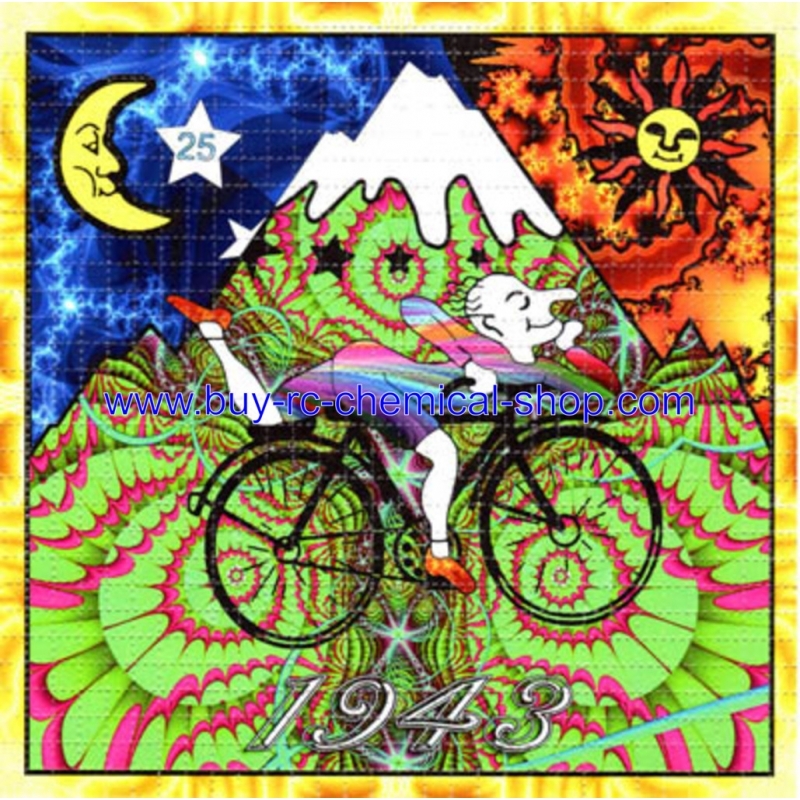 Bicycle Day is increasingly observed in psychedelic communities as a day to celebrate the discovery of LSD. The celebration of Bicycle Day originated in DeKalb, Illinois, in 1985, when Thomas B. Roberts, then a professor at Northern Illinois University, invented the name “Bicycle Day” when he founded the first Bicycle Day celebration at his home. Several years later, he sent an announcement made by one of his students to friends and Internet lists, thus propagating the idea and the celebration. His original intent was to commemorate Hofmann’s original, accidental exposure on April 16th, but that date fell midweek and was not a good time for the party, so he chose the 19th to honor Hofmann’s first intentional exposure. … affected by a remarkable restlessness, combined with a slight dizziness. At home I lay down and sank into a not unpleasant intoxicated-like condition, characterized by an extremely stimulated imagination. In a dreamlike state, with eyes closed (I found the daylight to be unpleasantly glaring), I perceived an uninterrupted stream of fantastic pictures, extraordinary shapes with intense, kaleidoscopic play of colors. After about two hours this condition faded away. Beginning in the 1950s, the US Central Intelligence Agency (CIA) began a research program code named Project MKULTRA. Experiments included administering LSD to CIA employees, military personnel, doctors, other government agents, prostitutes, mentally ill patients, and members of the general public in order to study their reactions, usually without the subjects’ knowledge. The project was revealed in the US congressional Rockefeller Commission report in 1975. In 1963, the Sandoz patents expired on LSD. Several figures, including Aldous Huxley, Timothy Leary, and Al Hubbard, began to advocate the use of LSD. LSD became central to the counterculture of the 1960s. In the early 1960s the use of LSD and other hallucinogens was advocated by new proponents of consciousness expansion such as Leary, Huxley, Alan Watts and Arthur Koestler, which profoundly influenced the thinking of the new generation. On October 24, 1968, possession of LSD was made illegal in the United States. The last FDA approved study of LSD in patients ended in 1980, while a study in healthy volunteers was made in the late 1980s. 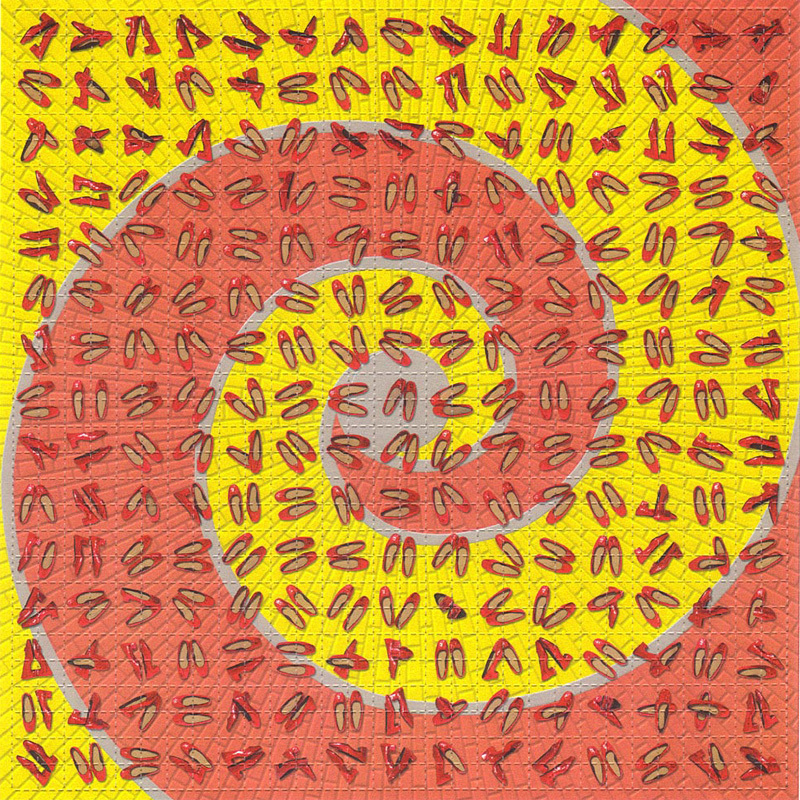 Legally approved and regulated psychiatric use of LSD continued in Switzerland until 1993. I grew up in the 1960s so acid and psychedelic counterculture is old hat for me. By just in case you are too young to remember those crazy days I’ll give a brief synopsis. By the mid-1960s, the psychedelic lifestyle had already developed in youth countercultures in California, particularly in San Francisco, with the first major underground LSD factory established by Owsley Stanley. From 1964 the Merry Pranksters, a loose group that developed around novelist Ken Kesey, sponsored the Acid Tests, a series of events primarily staged in or near San Francisco, involving the taking of LSD (supplied by Stanley), accompanied by light shows, film projection and discordant, improvised music known as the psychedelic symphony. The Pranksters helped popularize LSD use, through their road trips across America in a psychedelically-decorated converted school bus, which involved distributing the drug and meeting with major figures of the beat movement, and through publications about their activities such as Tom Wolfe’s The Electric Kool-Aid Acid Test (1968) – a good read. 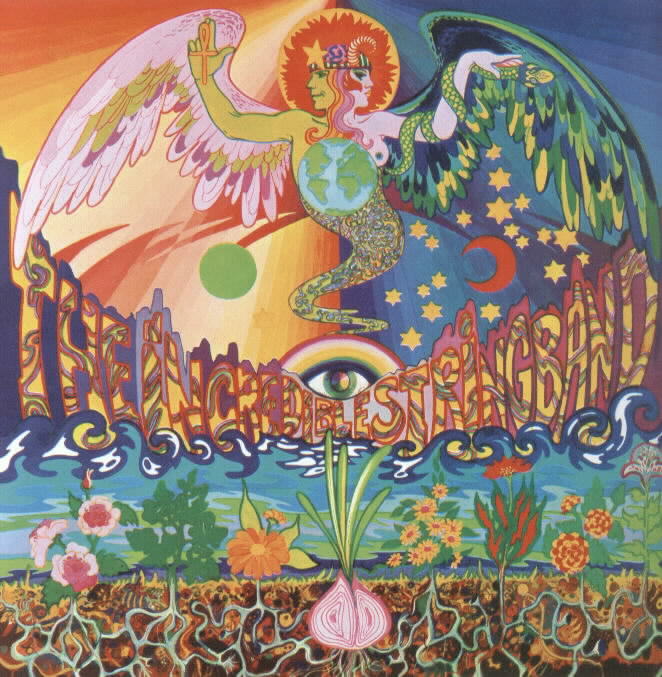 In both music and art, the influence on LSD was soon being more widely seen and heard thanks to the bands that participated in the Acid Tests and related events, including The Grateful Dead, Jefferson Airplane, and Big Brother and the Holding Company, and through the dazzling and wildly inventive poster and album art of San Francisco-based artists like Rick Griffin, Victor Moscoso, Bonnie MacLean, Stanley Mouse & Alton Kelley, and Wes Wilson. 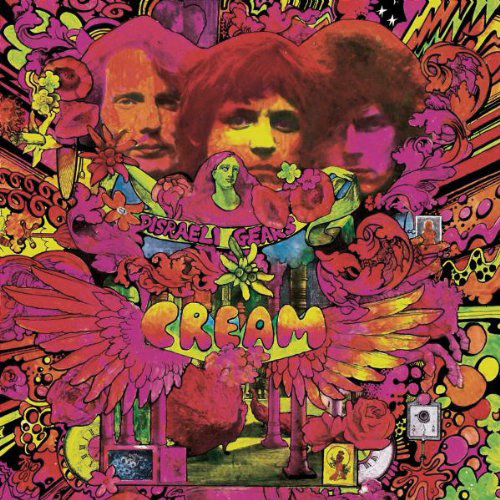 A similar and connected nexus of LSD use in the creative arts developed around the same time in London. A key figure in this phenomenon in the UK was British academic Michael Hollingshead, who first tried LSD in the US in 1961 while he was the Executive Secretary for the Institute of British-American Cultural Exchange. 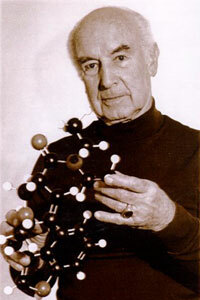 After being given a large quantity of pure Sandoz LSD (which was still legal at the time) and experiencing his first trip, Hollingshead contacted Aldous Huxley, who suggested that he get in touch with Harvard academic Timothy Leary, and over the next few years, in concert with Leary and Richard Alpert, Hollingshead played a major role in their famous LSD research at Millbrook before moving to New York City, where he conducted his own LSD experiments. In 1965 Hollingshead returned to the UK and founded the World Psychedelic Center in Chelsea in London. Among the many famous people in the UK that Hollingshead is reputed to have introduced to LSD are artist and Hipgnosis founder Storm Thorgerson, and musicians Donovan, Keith Richards, Paul McCartney, John Lennon, and George Harrison. Although establishment concern about the new drug led to it being declared illegal by the Home Secretary in 1966, LSD was soon being used widely in the upper echelons of the British art and music scene, including members of The Beatles, The Rolling Stones, The Moody Blues, The Small Faces, Pink Floyd, Jimi Hendrix and others, and the products of these experiences were soon being both heard and seen by the public with singles like The Small Faces’ “Itchycoo Park” and LPs like The Beatles’ Sgt Pepper’s Lonely Hearts Club Band and Cream’s Disraeli Gears, which featured music that showed the obvious influence of the musicians’ recent psychedelic excursions, and which were packaged in elaborately-designed album covers that featured vividly-coloured psychedelic artwork by artists like Peter Blake, Martin Sharp, Hapshash and the Coloured Coat (Nigel Waymouth and Michael English) and art/music collective “The Fool.” Memories !!! In the 1960s, and ever since, when LSD became illegal, people have tried to promote natural (legal) foods that can produce hallucinations. 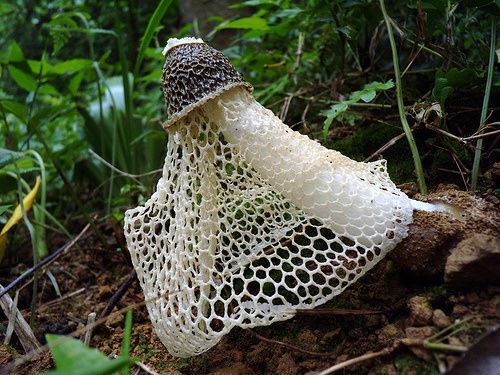 Most mushrooms with hallucinogenic qualities are banned in the West, but I know of a few that can be legally obtained in China. In fact I’ve seen a number sold on the streets in cities, but never bought any because the sale is largely unregulated and people die annually from poisonous mushrooms. I did buy quite a few funky looking mushrooms for culinary purposes, however, and lived to tell the tale. Heavy doses of very hot foods created with powerful chile peppers are also known to induce hallucinations, though not reliably. I’m a big fan of intense curries and have never experienced anything other than tongue-searing heat, pouring sweat, and the feeling that my eyeballs were falling out. It is also said that large doses of ground fresh nutmeg (2 tablespoons or more) can be hallucinogenic. As with chiles and other home experiments I DO NOT RECOMMEND this. 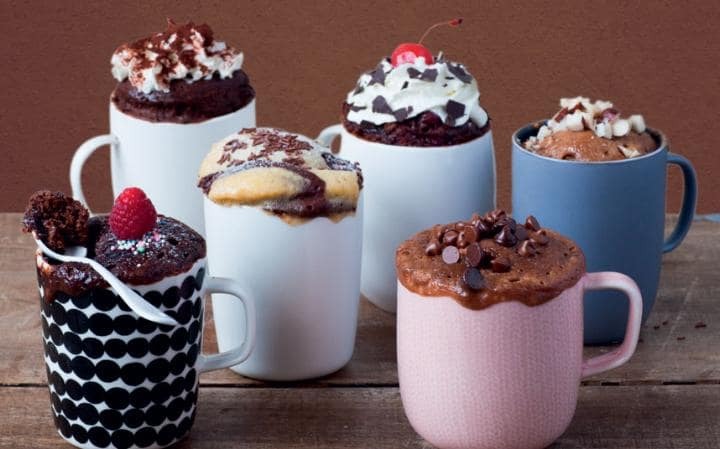 You’re more likely to get nauseous than anything else, and there may be physical damage. 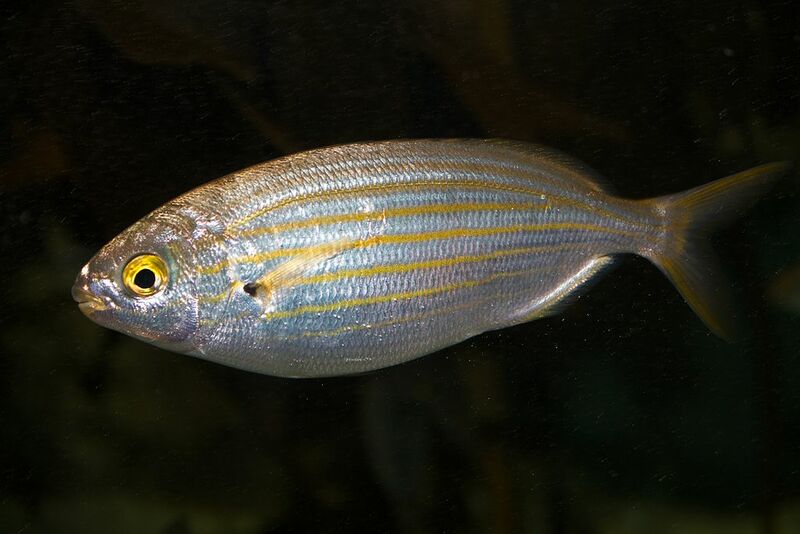 It has been known for centuries that Sarpa salpa, known commonly as the salema, salema porgy, cow bream or goldline, a species of sea bream, recognizable by the golden stripes that run down the length of its body, can cause hallucinations when eaten. It is found in the East Atlantic, as well as the Mediterranean, ranging from the Bay of Biscay to South Africa. It has occasionally been found as far north as Great Britain. It is quite common and found from near the surface to a depth of 70 m (230 ft). Males are typically 15 to 30 cm (6–12 in) in length, while females are usually 31 to 45 cm (12–18 in). Sarpa salpa became widely known recently for its psychoactivity following articles published in 2006 (and disseminated widely), when two men ingested it at a Mediterranean restaurant and began to experience auditory and visual hallucinogenic effects. These hallucinations, obviously unexpected, were reported to have occurred minutes after the fish was ingested and had a total duration of 36 hours. Salema is, in fact, often served as a dish at seafood restaurants in the Mediterranean area without these effects. It is believed that this and other Mediterranean fish sometimes ingest a particular algae or phytoplankton which renders it hallucinogenic. These effects have been reported sporadically all the way from classical times by Greeks and Arabs – often after eating the head. 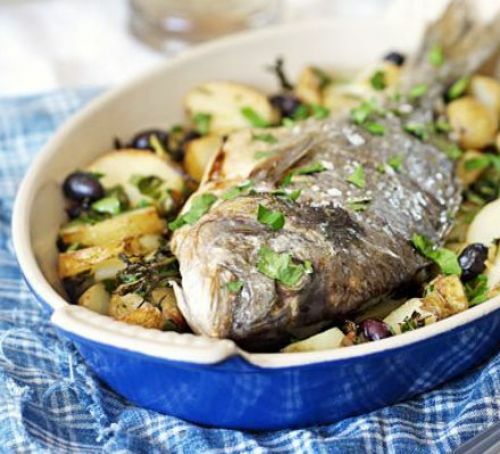 Varieties of sea bream are quite readily available and can be prepared in any number of ways – poached, fried, baked, grilled, etc. I’ve always been a big fan of oven baked whole fish because there’s nothing much to it, the fish is tasty, and the results are healthy. Make sure the fish is scaled and gutted. Place it on a well greased baking tray, fill the cavity with lemon slices, drizzle with extra virgin olive oil, and bake in a pre-heated oven at 500°F (or hotter) until the skin is browned and the meat is cooked through – between 20 and 30 minutes. Serve on a bed of boiled new potatoes (black olives add a spark), with a green salad or poached green vegetables. I usually go with spinach or asparagus.